I've got good news: The Pink Room is in the news! The cast, crew and artists discuss the fandom, fan art and the influence Twin Peaks has had in the creative community. TWIN PEAKS, the 18-hour limited event series will debut with a two-hour premiere on Sunday, May 21 at 9PM ET/PT. Subscribe to the Twin Peaks YouTube channel: http://goo.gl/ANCq6b Don't have SHOWTIME? The Pink Room Burlesque on ABC News' Nightline! The Pink Room Burlesque assists DirecTV with how to throw an amazing Twin Peaks Party! 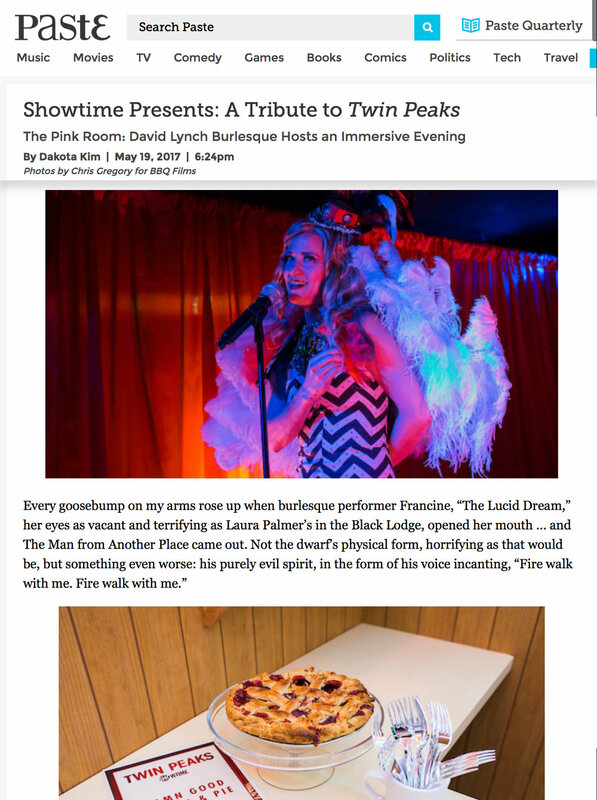 A Tribute to Twin Peaks - Showtime's immersive pop-up event by BBQ Films covered by Salon. More photos by Christopher Gregory of A Tribute to Twin Peaks!